Nothing takes you back to your childhood more than a good wooden slingshot. In all honesty if you are a collector, you are going to want one of these hand carved wooden Sling Shots. These whimsical sling shots will take you back to your glory days, and make you feel young again. Hand Carved from seasoned wood, these souvenirs make a wonderful gift that really screams Alaska. carved from wood each one is unique. These Sling Shots are available in three different designs. The Lovable Moose is depicted on the first one. His Antlers spread wide forming the body of the this wonderful keepsake.. The Majestic eagle is the subject of the second Sling Shot. His wings unfold to form the body of this collectible Weapon. The third and final wooden sling shot bears the awesome semblance of a fierce Grizzly bear. 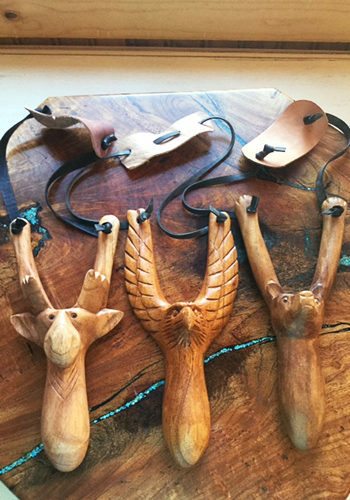 These wonderful hand carved wooden Sling Shots would make a stunning addition to any collection. Whether you buy one or all of these marvelous Sling Shots, you will be glad you did. Customers looking to buy Wooden Sling Shots online at wholesale prices have come to the right place. Sign up today for our wholesale program and begin enjoying savings, savings of up to 50% on all of our wonderful products.